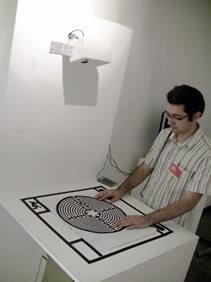 A laser spot bounces on a figure being drawn on paper, trying to escape the labyrinth of lines. There is no camera nor projector; Sticky Light proposes an experience where the audience can touch and interact with a beam of pure light - and even play a pong game with bare hands. The quality of the laser light, and the fluidity of the motion makes for a very unique experience. 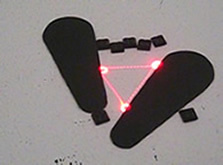 The piece is based upon a 3d tracking technology developed in our lab in 2003, using a laser diode, a pair of steering mirrors, and a single non-imaging photodetector called the "smart laser scanner" (for details, see here). The hardware is very unique: since there is no camera nor projector (with pixellated sensors or light sources), tracking as well as motion can be extremely smooth and fluid. (The laser power is less than half a milliwatt - half the power of a not very powerful laser pointer - and does not supposes any hazard). When alone, the laser dot perform enlarging spirals until it finds some objet of interest with which to play (fingers, hands, drawings, etc). A dialog then establishes naturally between the user and the spot of light - whose wanderings seems always playful and purposeful. As an art installation, the most interesting aspect of the work is that it promotes a reflection on the role of light as a passive substance used for contemplating a painting or a drawing. Natural light, or an artificial spot of light is always necessary to illuminate what we want to see; the quality of the light, the position and angle will modify the perception of a painting. In fact, the source of light is not really passive: it interacts and modifies the perceived work in an essential way. The installation amplifies such effect: it gives the light spot new ways of interacting with the painting; it augments its content by scanning the drawing, following the lines and bouncing on the colors. 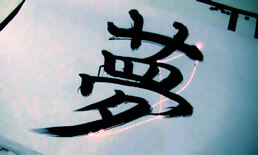 By moving on the drawing, the light spot attracts the attention of the viewer. It actually forces our sight to follow the dynamic path taken by the light. 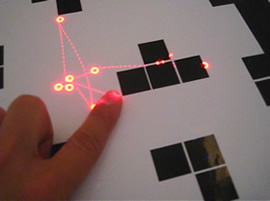 From the point of view of HCI research, this system (which is now being miniaturized using MEMS micromirrors) will certainly find a number of applications in domains as varied as design and advertisement, augmented/live architecture, entertainment, human computer interfaces, ubiquitous, (and in the near future) wearable displays capable of interacting with their immediate surrounding. 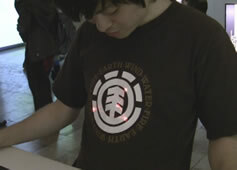 Alvaro Cassinelli, Yusaku Kuribara, Stephane Perrin and Masatoshi Ishikawa, Sticky Light showcased at Ars Electronica - Tokyo University Campus Exhibition(HYBRID EGO), Linz, Austria, 4-9 Sept. (2008). Ref: Campus Exhibition catalog [PDF-4MB].